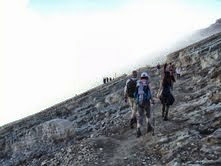 Offers to lead you explore and experience spectacular view of volcanoes of Java. We begin the days of our journey by hiking up summit of old volcano Merbabu,altitude 3142 m where you experience magical stunning views of surrounding volcanoes of Central Java as well as "closed up view of Indonesian most active volcano,Merapi 2900 m". Then led you traveling cross Central Java heads for East Java where you experience most spectacular sunrise slowly lights the earth of caldera of Tengger with background of volcanoes Bromo 2676 m and Semeru 3676 m as well as other smaller surrounding volcanoes.The journey included easy walk on sandy ocean heads for crater rim of volcano Bromo to take closer down looks of sulfur smoke coming out from crater.Hiking volcano Ijen 2386 m and walk down to visit it's crater 2145 m will completes this journey. Visit the world's largest stupa Borobudur in Central Java will be made en route to Merbabu Basecamp, and a chance to visit hidden waterfall as well as hot spring at Ijen zone will be available as extra visit. Weak up early in the morning, have warm tea and snacks, then transfer by our Ac car heads for starting point of hiking heads for crater's rim of Ijen.Make crater's rim in the morning, then proceed walk down ( depend on alert of Ijen ) to get closer looks of the crater and the stunning popular volcanic green lake of Ijen.After sight seeing, then walk up and descend back via the same trail heading for Paltuding.Break and enjoy cool drink at Paltuding before it's time for long driving heads for Surabaya passing through Ijen Caldera zone, stunning mountainous road, and some towns of East Java. Picnic breakfast at Ijen, lunch en route at local restaurant, and dinner at hotel's restaurant.Overnight by Hotel at Surabaya.